Everywhere we’ve lived has a wonderful group of people working hard to help the local animal population. In Roatan, there were several organizations we supported, especially the Roatan Humane Society that helped us find Lina. In Scotland, it was volunteering with the Edinburgh Dog and Cat Home that helped me to grieve and to feel like I was doing something to honor Lina’s legacy. And in Malta, it is Noah’s Ark Dog Sanctuary that deserves our attention and respect. And, selfishly, it’s the place where we can feel loved by so many wonderful dogs. The sanctuary has been operating in Malta since 2004, after a concerned scuba instructor rescued a stray and starving dog, cared for her, and then found her a loving home. Since then, the sprawling facility in Mellieha has been utilized and around 100 dogs typically call it home. 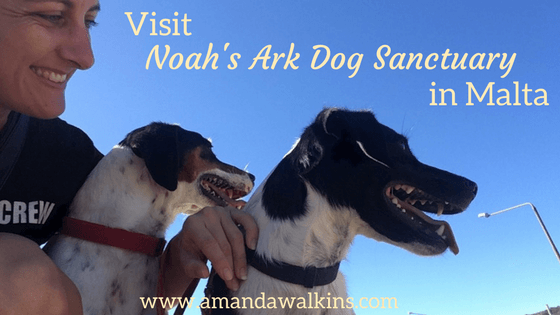 Noah’s Ark Dog Sanctuary is a true safe haven for these stray and abandoned dogs. While Malta has nowhere near the stray population we saw in Roatan, there are still many people who abandon dogs. It is not uncommon for the volunteers to find a dog tied to their front gate in the morning, having been left there overnight by some owner who no longer cares. It is also not uncommon for a farmer to bring a litter of pups into the sanctuary since he or she only needs one dog around. The sanctuary volunteers care for these 100 or so dogs at all times. As a no-kill shelter, some dogs have been there for years. Others find new homes quickly. But all of them deserve loving families to take them in forever. Visitors may go to the sanctuary any morning to see the dogs. But the awesome bonus with Noah’s Ark is that you can even take the dogs out for a walk! Most rescue centers require official volunteer applications and somewhat drawn-out procedures to have this opportunity, but I love that Noah’s Ark allows any visitor to take the dogs for a walk. They just ask that you fill out a super simple volunteer registration form with contact information (which you could also do in advance if you contact them online). Frankly, it’s a win-win for everyone! With so many dogs in regular residence, the volunteers simply cannot give them all the love and attention they need every day. With visitors volunteering to come by to fill that role, all the dogs get more exercise and love. It doesn’t hurt that the views just 100 yards from the sanctuary are absolutely stunning! We took 4 pups out for a stroll with some friends of ours. Tikka, her sons Foxy and Any, and sweet little Georgia joined us for a Sunday jaunt. Other than Any giving us a quick scare when his collar came loose and he took off, the dogs all got along well and were just lovely to walk around with. Don’t worry, the Irish-Colombian chased Any down and caught up when a delightfully well-trafficked corner attracted him to stop and sniff. As with all animal rescue organizations, there are so many ways you can help Noah’s Ark Dog Sanctuary! If you’re ready and able to adopt one of these precious pups, you can see the dogs available for adoption with frequent updates and urgent requests on the Noah’s Ark Facebook page here. For inspiration, you can find lots of happy stories about former Noah’s Ark residents who have found their forever homes in their Facebook group here. You can also choose to donate money or in-kind donations to support their very worthy efforts. You can send dog food to Noah’s Ark via their collaboration with Animals Life here. To donate to Noah’s Ark Dog Sanctuary and to support the extraordinary work they do, please visit their website or donate directly via PayPal by sending to noahsarkmalta@gmail.com. And, of course, if you’re in Malta and want to help, you can always donate in-kind goods like bedding, collars, and leashes. You can also donate your time as a regular volunteer, or at least as a dog walker whenever you’re free to do so! I’m sure you’ll have a great time meeting these fabulous furballs, just like we did. We’ve been expats in multiple countries, including Honduras, Scotland, and Ireland. We are currently living on the Mediterranean island of Malta. You can follow our adventures by subscribing to my newsletter below, and join me on social media, too! I’m on Facebook, Instagram, Twitter, and Pinterest. You’ll see lots of daily expat life updates on those platforms. See you there!